From the time that the last frame of Charlton Heston's Planet of the Apes (1968) came into focus, audiences have wondered: how did we get there? how can it be that, two thousand years into our future, apes have become the dominant species on earth? what could have happened that caused this fictional landscape? Now, over 40 years later, filmmakers have given us some possible answers. Rise of the Planet of the Apes (2011) is a re-imagining of the modern day origins of this reversal of fortune. 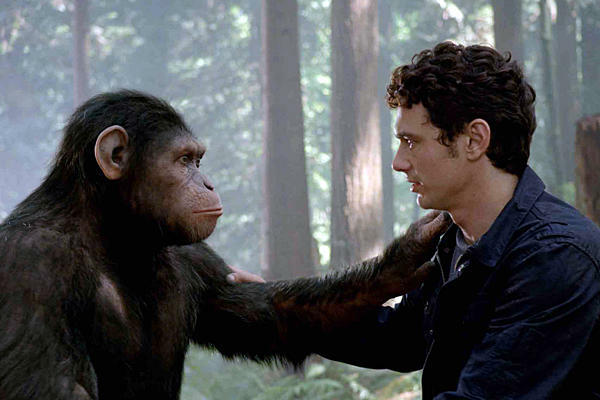 It seems that it all began with Caesar (digitally acted by Andy Serkis), a chimpanzee born of a genetically-tested primate who went on a fatal rampage in order to protect her child. After the ape-testing program was discontinued as a result of this, Will Rodman (James Franco), a dedicated young scientist at the lab, saved Caesar in a Moses-like fashion by hiding him in his home for next several years. Without genetic tampering, Caesar still inherited and built upon the intelligence of his mother. Raised in Will's human household, Caesar learned not just skills like writing, using utensils, and sign language, but also the values of compassion, justice, and mercy. But when Will's Alzheimer's inflicted father Charles (John Lithgow) accidentally gets into trouble with the neighbors, Caesar jumps in to protect him; unfortunately, though, the chimpanzee's strength and power proves dangerous with unprepared humans. Again like Moses, he is exiled - and caged with other primates in a prison-like facility. Ultimately, and in yet another nod to the Moses story, Caesar finds a new home with his own kind and leads them out of slavery towards a promised land among the California Redwoods. It's not the Moses connection that haunted me about this film, though. Instead, it was the social issues that this movie raised that stuck with me long after the movie's eye-opening (and creatively telling) closing credits were over. And while not specifically portraying this, the imprisonment and treatment of the apes mirrors issues such as human trafficking, dismissal and poor conditions of the homeless and those with mental illness, and cultural genocide and oppression by the rich and powerful. The filmmakers pile on the social issues as if to say this is how society crumbles and could potentially lead to the fall of the human race (and thus the rise of the apes). This is also a lesson the Church has promoted through its social teachings over the centuries. A nation is defined by how it treats its poor and most vulnerable citizens - and by that standard, those definitions are not necessarily stellar. Some think faith and culture/society should be separate. They say that churches should spend their time praying and worshipping instead of getting involved in political and social matters (like those mentioned above). But faith isn't just about conversing with the Almighty - it's also about transforming the world. One of the most intriguing passages from Scripture involves Jesus proclamation to "Render unto Caesar what is Caesar's and to God what is God's." (Mk. 12:17) On one hand it seems to support those who say that religion and the social world shouldn't mix - each one should stay in their own corner. Yet this is not what Jesus was going for. He was saying: be people of the world AND be people of faith. Concern yourself with transforming your faith AND the world around you. This movie does not pretend to have all the answers for the questions it raises. But it does open our eyes to the world we currently live in. It is no fiction that corporations are profiteering off the backs of the economically stricken. Nor is it fiction that our genetic and scientific tests are pushing the boundaries of ethics. And it is not fiction that violence, oppression, trafficking, and environmental abuse is taking place as we watch this movie - perhaps even in our own backyard. And perhaps this is where we return to the Moses connection. In the Hebrew Scriptures, Moses wasn't just the man who split the Red Sea or went up Mt. Sinai. Moses was a leader who, against all odds, stood up for those who were oppressed, beaten down, and forsaken. He stood in opposition to the violence of the Egyptians, to ethnic cleansing of the Israelites, and to those who would abandon the Law for their own selfish gain. If we are to prevent the fictional unraveling of society as portrayed in Rise of the Planet of the Apes, we need people of faith to stand up as leaders for the social issues of our day. We need to channel our innermost Moses like Caesar the chimpanzee - and bring the gospel into the world. Where do we start? Like the movie, there are so many concerns - and it can seem overwhelming. The best advice is to look to one or two (perhaps ones that we have a personal connection with or ones that we have the most resources at our disposal to combat) - and with those, seek out ways to integrate the church's teachings into that issue... and get to work at it. Let us all pray that we have the courage to transform our world. AN ADDITIONAL NOTE: It is also fascinating that, in the film, Caesar never resorted to murder to make his point. His first foray into human speech came when he shouted "No!" to the killing of the guard who abused him. The environment of love and compassion that he was raised in (through Will's home and family) must have triggered in him a gospel-like aversion to murder. And when he took on the mantle of leadership of the other primates, he encouraged them as well to avoid the taking of human life. His example, though not perfect, is put in contrast to the belligerence and trigger-happy reaction of the humans who had no problem with killing and violence. Perhaps this is yet another lesson we can take away from all this. No matter how much we are mistreated and abused (a social issue in and of itself), murder and war are never the answer. Rather, our God calls us to turn the other cheek and to love our enemies - and in so doing, we transform not only ourselves but the world around us.